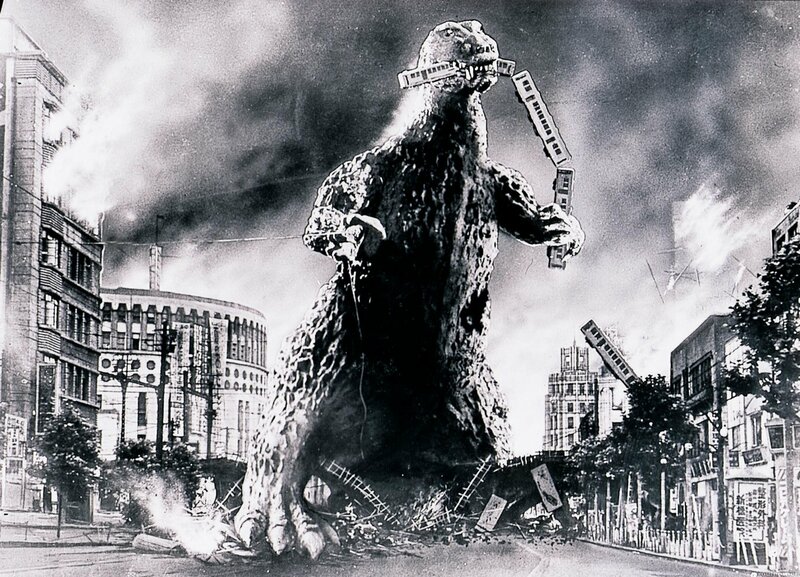 I love Godzilla, he’s great, not the rebooted versions but the original Toho creation hailing from 1950s Japan. My youth was riddled with dreams of a giant monster storming the cities of the world, sometimes a bad guy, sometimes a good guy, he was an all-round winner to me. 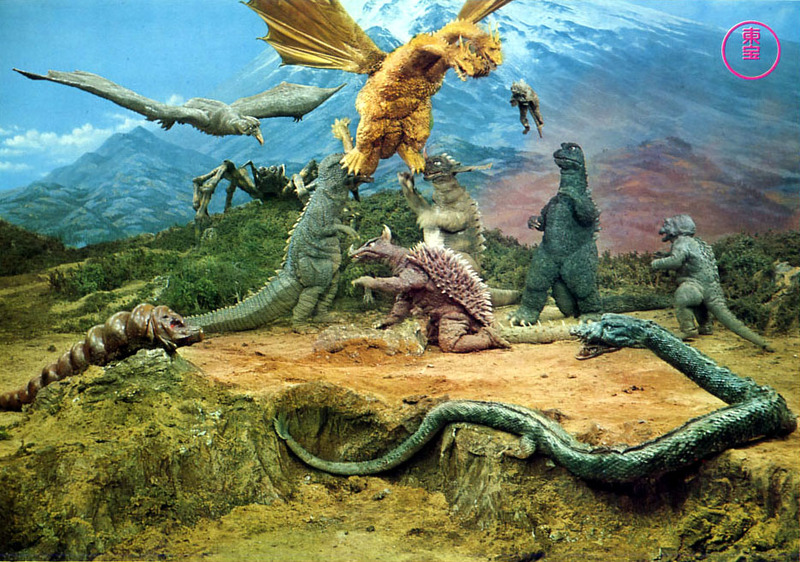 Unfulfilled by the campy films of Destroy all Monsters, Godzilla, Son of Godzilla and Godzilla v King Kong I craved Godzilla in all forms- a roaring piggy bank, a model of Mechagodzilla, toys of Ghidrah and Gigan and, best of all, a Beanie Baby Mothra. While this fascination with Godzilla in may have subsided with my juvenescence it was reawakened like the scaly behemoth from the depths of the ocean upon the announcement of a traditionally fashioned Godzilla reboot this year. Rather than rekindle the B-Movie brilliance of the Japanese originals, Gareth Edward’s 2014 reimagining is a steaming pile of blockbuster misery, an insult to the viewing public’s intelligence and generally has less ingenuity than the latest Transformers. Not perturbed by indiscretions to Godzilla’s leg size or nose girth in 2014, the root of my rage is the tediously generic formula that Godzilla utilises- take the laser breathing monster out and it could be any other blockbuster forged out the last few years- lots of end of world city destruction, tedious martyrdom willing heroes and one dimensional support in the wings. Godzilla’s descent into a monstrosity is unforeseeable during the first 45 minutes; some extremely stylish opening credits, filled with faux convert documents and footage relating to the mysterious mass from the prehistoric, convincingly express an ominous 1950s nuclear testing cover up surrounding ‘Godzilla’. Moving into the 1998 (a sly nod to the generally derided Roland Emmerich Godzilla?) 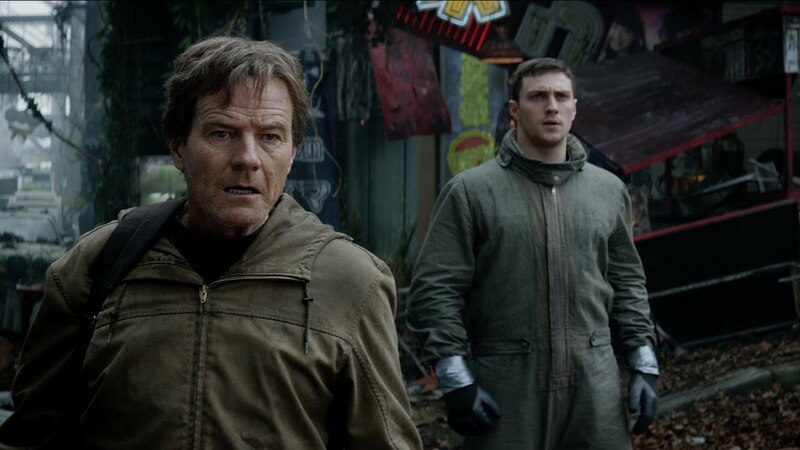 we encounter Joe Brody (Bryan Cranston) and his family who are posted in Japan while he manages a nuclear power station. On one downtrodden day of drizzle disaster strikes in the form of an unidentifiable ‘earthquake’, destroying the power station, and long with it his wife Sandra (Juliette Binoche), leaving Brody to raise his son alone and obsessively discover the truth about the disaster. Fifteen years later, Joe’s son Ford (Aaron Taylor-Johnson), now an army officer, is called back to Japan in order to bail out his estranged father for trespassing in the old, radioactive nuclear site. Initially unconvinced by his father’s crackpot conspiracy theories, Ford eventually accompanies his father on an illegal expedition. Soon they’re arrested and held in the unusually busy former nuclear site, where they unfortunately are when a huge MUTO (Massive Unidentified Terrestrial Organism) awakens from its 15 year cocoon. 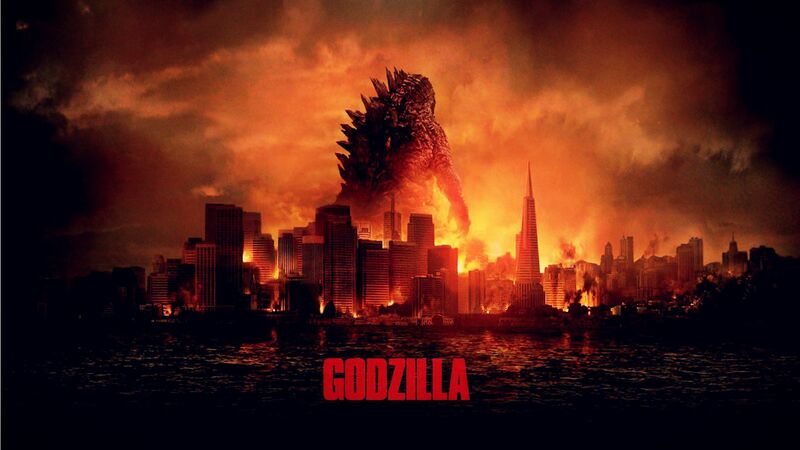 Ishiro Serizawa (Ken Watanabe) and Vivienne Graham (Sally Hawkins), along with the US army, recruit Ford and son to aid them in pursuit of this destructive beast, yet the worst is yet to come as Godzilla and another oversized, nuclear freak are awakened in the aftermath. As the scene is set all looks rather promising for the subsequent scenes- excitement’s built for Godzilla’s emergence, Bryan Cranston’s performance adds weight, credibility and gravitas while the slow pace ensures that there’s some substance to the characters beyond being perfunctory to monsters fighting, the real showpiece. Yet all of a sudden, on one crucial narrative pivot the entire film crumbles like San Francisco’s skyscrapers under Godzilla’s ample derrière. Those watching we’ll know when they see it; it’s the point of no return for Godzilla’s decline into an appalling abyss of monotony and predictability. Ever since Nolan’s stern, Gothic portrayals of Batman blockbusters have attempted to recreate the compelling, refreshing, atmosphere. Nolan succeeded by placing Batman in a believable context, tarnishing known characters and villains with a hefty dose of reality along with contempt for formulaic clichés; Godzilla attempts the former without providing any credible supplements. The characters are one dimensional bores, the narrative becomes encumbered with plot holes and the story drags to a monotonous, wholly predictable climax that only baits an unwanted sequel. There’s a positive correlation between Aaron Taylor-Johnson’s growing prominence and the level of tedium inflicted on the audience, his portrayal of Ford is wooden and oiled with all the hallmarks of a typecast action hero- tall, dark, handsome, selfless in the face of adversity and completely unrealistic. Johnson’s Ford is the all American hero without any of the token star power that contemporaries like Marvel pride themselves on. The supporting pack are straight from the pages of ‘The A-Z of Blockbuster Casting’; Dr. Ishiro Serizawa is the pensive scientist who knows best, Rear Admiral William Stenz (David Strathairn) is the shoot first, ask questions later army man and Elle Brody (Elizabeth Olsen) is the hapless, often stranded, wife. The plot fairs little better past the first third, beyond that the film rumbles along repetitively, alternating between oversized monsters trampling through cities and the US army failing spectacularly with another hair-brain scheme involving nuclear warheads. These skirmishes into story telling aren’t aided by numerous assaults on the audiences’ logic and common sense, clearly the premise is ludicrous from the start but the many plot holes defy plausibility on any level. A muddled, obligatory allegory/condemnation/promotion of the use of nuclear weapons rounds off the derisory plot. Bar a well teased reveal of Godzilla, looking like a wholesome cousin to his 1950 original, the iconic lizard is criminally underutilised despite being star of the film, his underexposure oddly asymmetrical to MUTO’s constant appearances. A few nifty atmospheric shots coupled with snippets of impressively choreographed monster battling are highlights in an otherwise familiar rubble fest of falling buildings- San Francisco, Chicago or LA; it all looks the same when it’s being destroyed. Godzilla is the perfect example of everything that’s wrong with the modern day blockbuster; over budgeted, reliant on a brand created decades prior and, most deflating, stuck in using the same stock characters, effects and story. It’s cinema by numbers, there’s almost nothing original or creative in Godzilla, take away the brand name and you’ve got the hollow foundations for any old film revolving around extraordinary entities threatening to destroy earth. Godzilla is guilty of abusing a tried and tested box office formulae, it seems Hollywood has forgotten that blockbuster’s existed long before superheroes and reboots, innovative efforts like Jaws or Star Wars that appealed to both the casual mainstream and the serious filmgoer have been replaced by big budgeted bore fests with little artistic merit. Hopefully Godzilla vanishes into the ocean’s abyss before he can be exploited in a money spinning sequel.